Home » "SoapBox" Blog » I’m Eligible for AAR… WHAT?! I’m Eligible for AAR… WHAT?! Have you received that letter? You know the one, with that big red and white logo, from that organization called… A-A-R-P. I opened it once and it actually was a very nice invitation asking me to join their group of … ahem … older people. So, I tossed it. Then it came again a few months later. And then again months after that. Seems it’s inevitable that this letter will show up in the mailbox. It’s as inevitable as, well, getting older. It happens to us all, this getting-older/aging/maturing phe-nom, and in the big scheme of things, who wouldn’t want to keep getting older, marching forward in time, living life to its fullest? “Aging” baseball player Satchel Paige said that at the tender age of 42 many years ago when asked how someone as “old” as 42 could keep playing. He sure got that right. 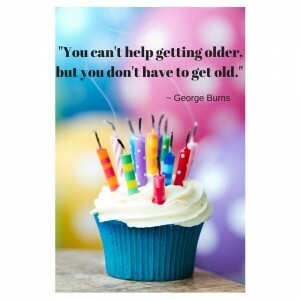 Whether we like it or not, it’s all in our thinking… how we handle this “aging” thing. I’ve been reading a book by Jo Ann Jenkins, the CEO of AARP, called “Disrupt Aging”. She is a dedicated advocate for changing the way our society looks at aging. She says instead of a time of diminishment, to see it as a time of growth; instead of a burden, to see it as a time of contribution. Makes sense to me. A lot of sense. And ok yes, because in the not too far off distance, I will be one of those “older” people. And hey, you will too. So let’s start working on that mindset now, practicing being contributors and growing positively and gracefully into our older years. I really like that one. Old age can be waaaay out there in the distance if we so choose. In her book, Ms. Jenkins brings up an interesting idea: What if we didn’t know our actual age? What if you didn’t associate anything about yourself with a number? What would you do, wear, have, drive, feel, be? That’s a fun exercise. Take a minute and jot down some ideas on that one. Don’t let a number hold you back. Unfortunately, she goes on to say, we’ve had it drilled into us that aging is a bad thing, a time of deterioration, dependence and decline. Ugh. Here’s the challenge she presents: Own Your Age. Embrace it. Feel good about it and all you’ve done so far. And know there’s more good stuff to come. “Experience matters”, she says. I’ve been realizing that myself, how much wisdom and experience there is to appreciate as times goes on. I’m putting together lots of pieces gained over the years and things are clicking and making sense. It’s that perspective that only age can give you. Oh, and I finally embraced my eligibility and joined AARP, formerly known as the American Association of Retired Persons. I am now a card-carrying member of that organization dedicated to serving the over 50 crowd and now especially determined to change our society’s view on aging. It’s the new, forward-thinking AARP, now where that RP stands for “Real Possibilities”. BTW, how’d you like YOUR carefully crafted, well-thought out, and usually unopened, letter thrown out the minute it hits a receiver’s hands? Think about Ms. Jo Ann Jenkins and her crusade next time you’re ready to toss her letter. Give her words a quick read and remember her mission. Own Your Age. I really don’t care how old you are. You are a contributor, valuable, magnificent, wise and wonderful at every age. Hi Debbie- Thanks for this reminder! Very helpful as I move forward in this part of my life. Thanks for a great article Debbie! As with everything, it’s all in our own perspective. If we are one of the fortunate ones to be able to grow older, why not embrace it, have fun and not give a hoot what anyone thinks (that’s one of my favorite things about aging 😄). I tell my whole, perfect and complete body that “I am 62 going on 23!” It’s a Mind Body connection. LOL, it works for me. We create our reality. Deepak Chopra talks about health and aging in his book, “Creating Health” Ageless Body, Timeless Mind.